The walls of your home have the power to transform your space with the help of paint or wallpaper. A dramatic room can instantly be made soft and airy with the application of light pale paint color. While a room that feels too big can instantly feel cozy with darker wallpaper with a striking pattern. So which is better? There are pros and cons of using both. Factors to consider are ease of application, cost, and versatility to your space. Whichever you choose, your walls will benefit from the beauty they add! WALLPAPER - Con: Removing existing wallpaper can be a tedious task that requires patience and the right tools to be effective. Stripping wallpaper can be done with chemicals or stripping tools, but care must be taken or damage can result to the wall. Consult a home improvement store for specific instructions for your application. PAINTING - Pros: If you are painting over a damaged wall, prepare imperfections with spackle and let dry 24 hours in advance. Applying primer paint in advance to painting over darker color paint will make your painting preparation easier. Painting requires considerably less preparation time than wallpaper. Wallpaper and paint can range in price from the low end to the high end of the cost spectrum. Wallpaper on average is more expensive to purchase the rolls, supplies and to have it installed. Paint on average is cheaper and requires very few supplies, and an amateur can apply it. It should be noted that inexpensive wallpaper can be purchased and if you do it yourself can cut down on installation costs. Similarly with paint, higher end faux paint finishes, and textured paint can be expensive especially if it needs to be professionally applied. A combination of both: Many people want the versatility of adding a texture to their wall with customizable paint colors. Paintable wallpaper is a product that comes in rolls or adhesive squares. After the textured wallpaper is applied, it can be left bare or it can be painted. Paintable wallpaper is the best of both worlds! Both paint and wallpaper comes in unlimited varieties and colors. Paints come in various glosses and sheens, while wallpaper comes in paper and vinyl surfaces for durability and finish variation. The lifestyle of your family can make a considerable difference in which finish you select. WALLPAPER - PROS: Wallpaper is very durable and will hold up to wear and tear of children, high traffic areas and many varieties are scrubbable. CONS: Since wallpaper is applied with an adhesive, high moisture bathrooms and kitchens may cause wallpaper to peel away from the wall. PAINTING - PROS: Depending on the sheen/finish paint is a good option for areas that need to have an inexpensive and easy application. Semi-gloss to high gloss paints are durable and are usually reserved for trim and exterior doors. Satin, Eggshell and occasionally Flat sheens are used on interior walls. CONS: When walls are damaged, scraped or hit, paint can chip and repairing and repainting will be necessary. Whatever you choose, we hope that you love the end result! 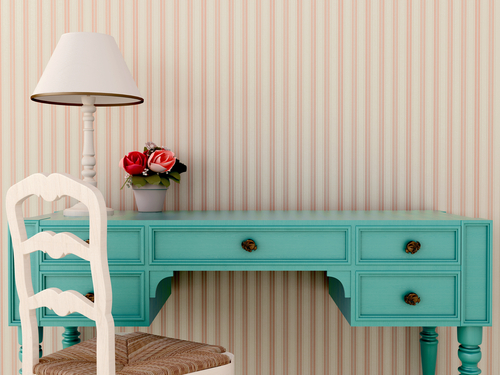 Which do you prefer: wallpaper or paint? Let us know in the comments below!